"Most Earth Aware Car of the Year"
As we watched a profusion of college students jog, skate, bicycle and schmooze their way past our Minneapolis hotel, we realized we were in for an education on what is important to those on the cusp of an environmentally challenging world. They were the kind, in their early 20s to maybe mid-30s it seemed, in plaid sneakers, cutoffs in cold weather and eyes glued to a smart phone screen. Just the type, we thought, who would be woed and won by a point-in-life auto like the resoundingly revised 2014 Toyota Corolla. OK, let's backtrack a little here. Aren't these the consuming, forwardly mobile young adults who are learning the hard way that using up one's resources like landfills, fresh water and international oil reserves – especially as they prepare to consider the future of their own emerging families – can create bigger issues in the future? And that paying for such fixes can come with a breathtaking price tag? But life without fun doesn't have much kick. That's something most students on a college campus would likely to understand. And maybe that's something Toyota understood when it set out to revamp its small car staple to give it the biggest green car boost in decades. We had come to the largest of Minnesota's Twin Cities to find out why Toyota considered its revised compact car so important as the automaker kicked off the 11th generation of this staple. After all, the Corolla has dominated the world of compact autos in all corners of the globe for decades. 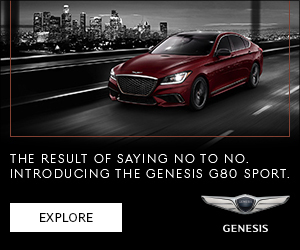 It virtually launched the small car industry in the U.S. when seeming block-long domestic gas guzzlers dominated American roads. And it has spawned a wealth of imitators seeking to dethrone it from its lofty perch ever since. It didn't take long to realize that not only was the Corolla a breath of fresh air visually, but in driving credentials as well. But it also pointed out how the auto is aiding in preserving the fresh air we breathe and protecting our planet by diminishing the factors that add pollutants to the atmosphere. And its achievement of reaching a lofty 40 miles per gallon mileage with an internal combustion engine heart rather than with a highly sophisticated and costly hybrid, clean diesel or more elaborate technology tells us there really still is life in yesterday's engine type when it's tamed and tweaked to accommodate tomorrow’s vehicles. With those gold star elements plus pricing that has not gone ballistic, it didn't take long to determine the 2014 Corolla was an uncompromising champion to be recognized. And so, it was name Earth, Wind & Power’s Most Earth Aware Car of the Year for 2014. 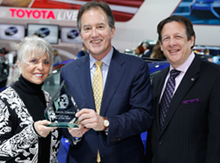 In accepting the award, Bill Fay, Group Vice President and General Manager - Toyota Division, cited the company's long-time commitment to good fuel economy. 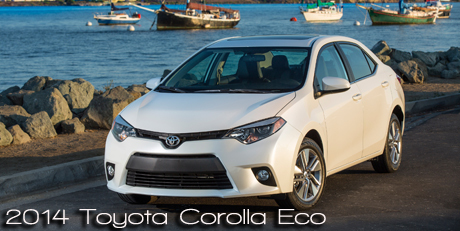 "For the past 47 years, Toyota has prioritized outstanding fuel economy for the Corolla. It’s this attention to detail that has enabled our company to sell a record 40 million Corollas worldwide," he said. Validating efforts to make vehicles more earth friendly is a major reason the awards were instituted, according to Courtney Caldwell, who founded the Earth, Wind & Power awards six years ago. “With climate change and dependence on foreign oil a major concern, more people than ever are turning to fuel-efficient or alternative powered vehicles,” said Caldwell, in announcing the winners for 2014. “It’s become of vital interest to consumers, automakers, and the future of the Earth to produce vehicles that are compatible with our planet," she said. "We believe a car like the new 2014 Toyota Corolla will be a great asset to consumers with its great gas mileage, small footprint, affordability and upscale design, especially for those who aren't ready to make the leap into hybrid or electric," she added, citing some of the reasons the Corolla also had resonated with jurors. Looks, amenities and driving the Corolla were also criteria for the selection. And we had the opportunity to check them out. On our arrival at our test drive headquarters in the center of the University of Minnesota campus, we caught a tantalizing glimpse of the Corolla parked outside and did a double take. It didn't look like the Corolla of old. It had authority with kick. It had svelter yet firmer lines, and a delicious surface that caught a changing kaleidoscope of sunlight and shadows in romping red and brazen blue. We delayed to get a longer look. That's not to say this is an avant garde auto. That could be a grand mistake. And Toyota obviously understands that. But changing a long-standing staple – the bestselling nameplate ever on a vehicle – that has served many generations of drivers in two centuries with just the right amount of verve is a balancing act. Again Toyota showed how it understands its loyal customer who still wants affordability and predictable dependability in addition to fun while driving. What they are getting with this new rendition is a bit bigger, a lot techier, and a sense of authority in a more athletic look that Toyota calls Iconic Dynamism. Among its impact is a smoother airflow that contributes to fuel economy gains and underscores three inches in added length with wheels moved further to the corners for a far sportier look and handling. The handling we encountered on urban streets wasn't outrageous. Going much bolder is not something you try out while cruising city streets or skirting the lofty edge of the Mississippi River on a drive that borders miles of handsome homes and river walks with those ubiquitous bikers and hikers that seemed to be everywhere. But electric power steering, and a stiffer, lighter-weight unitized body construction helped provide the responsive feedback that offers a more dynamic driving experience, the kind even an environmentally friendly driver can enjoy at times. And it served its purpose exactly, showing us how comfortable, purposeful, connected, uncomplicated and ultimately guilt-free a front-drive compact sedan for five in LE Eco mode – yet tuned for driving fun – can be. The LE Eco starts with a 1.8-liter four cylinder engine, then adds a continuously variable transmission (CVT) with Toyota's first North American use of "Valvematic" technology. This specialized drive train can get a five percent gain in fuel economy and horsepower and delivers 140-hp and 126 lb-ft of torque on the Corolla LE Eco. That's while earning mileage ratings of 30 city/40-highway (the magic number, or 42-MPG depending on our source) for a combined 34 MPG rating, all on regular grade fuel. The transmission has "gear points" to allow the driving feel of a non-CVT automatic preferred by most American drivers. Non-Eco L/LE and sporty S models sit on a base 1.8-liter four. The LE Eco has other tricks to enhance fuel economy, some included in the well-laid out, uncomplicated interior. While driving in ECO mode for example, climate features such as air conditioning are somewhat muted to help boost mileage. Interiors were more pleasing than expected, tailored but not dull or overly fussy. Information systems (and navigation when so equipped) had a 6.1-inch touch screen and the requisite high tech applications from Toyota's evolutionary premium Entune system with smart phone connections. Outside, visually, we learned the colors that earlier had smacked us to attention were actually named Barcelona Red and Blue Crush, both metallic for that lustrous sheen. Anchoring those color palettes were contemporary LED headlamps on every version. Despite smaller, 15-inch low rolling resistance tires on the LE Eco for better fuel economy, the overall profile is handsome and clean looking with a just slightly hiked up rear end for attitude that hides the rear backup camera. And green doesn't mean spartan in this case. Fog lights and heated, color-coordinated power side view mirrors are standard amenities. Consider only pricing and this redesigned car is a grabber. While it can move up the scale depending on ad-ons such as moonroof, driver convenience package or smart key/push button start, the base is still a jaw-dropping $18,700 in Eco mode. And the Corolla has something most hybrids undoubtedly would dream about: A space saver spare in the room not required for a weighty, bulky and costly battery pack. There even should be enough room in the Corolla's trunk to tote one of those fold-up bikes. Bridgestone, longtime sponsor and supporter of the EWP and ICOTY Awards, recognizes the significance of environmental changes that are currently affecting the planet and human life. "We would like to thank Bridgestone Tire for sponsoring the 2014 Earth, Wind & Power Car of the Year Awards," said Caldwell. Their continued annual support has allowed us to honor automakers for vehicles designed and engineered with power sources that contribute to a healthier and cleaner environment. About Earth, Wind & Power Media – The goal of EWP Media is to educate, enlighten, and empower consumers about alternative energy sources such as vehicles with high MPG and/or a small footprint, diesel and electric solar, wind, water and other natural resources so they can make informed decisions on which energy and fuel efficient vehicles to buy, improve and change their living habits. EWP aims to help educate consumers on where to find and how to use the tools necessary to convert their everyday lives into an organic and balanced state of living with and on our one and only planet. The mission of the EWP Awards is to honor vehicles that are driven by a power source that helps improve climate change by reducing the amount of CO2 emissions poured into the Earth’s atmosphere, promote a cleaner environment, and support the ultimate mission to achieve energy independence through alternative power sources. Vehicles are judged on their progress and ability to further reduce greenhouse gases in the Earth’s atmosphere. For more information on the Toyota vehicles, click here.